As many of us experience this New Moon Solar Eclipse, we can understandably have many questions about our life purpose and direction. Eclipses are simply very potent New Moons. They are providing and sometimes instigating opportunities for deep shifts to take place in our lives. In astrological terms, an eclipse occurs very near the Lunar Nodes. These are intersection points between the orbit of the Moon and the path of the Sun across our sky, or ecliptic. The nodes are considered powerful points where energy comes flowing in (North Node) and gets flushed out (South Node). When the Sun and Moon meet at these intersection points, an eclipse takes place. The resulting combination of Sun/Moon/Node creates an access point of great significance and potential. We are now in this moment. That is why the days leading up to and after are important pattern setting times. It is a time to state our intentions clearly and consciously because, in the six months to a year after an eclipse, we get a chance to experience and work with new growth. The changes can be sudden or incremental, but it is always significant. If we view this month’s New Moon Reading within this context, it can be characterized this way: We are rising to a new level of authority, and attainment of emotional intelligence and leadership. Each one of these cards describes stages of leadership so well. First, the 7 of Wands describes us as purposefully placing ourselves in view. We are stirred forward, whether through our ability to assert an opinion or display a talent, something has put us in front of others and we are facing an interesting situation. It takes courage to do this, to speak out, to show up on the “stage” of our life. But we are so often confronted by fear. Anxiety about what others are thinking, what their opinions about us and our abilities are, and if we will succeed or fail. Since this card doesn’t actually show anyone else except the main figure defending him (or herself), the notion that we are our own worst critic comes through clearly. We are facing our own judgments and barriers, our own limited understanding of our potential. As soon as we can recognize this, we move past the need to prove anything and we stop projecting all of our own issues and hang ups on other people. No longer wanting to be defined by what was but rather by what may be, we rise above the turmoil and we get free of something heavy and oppressive. We have individuated from our family, our peer groups, and our workplace. I interpret this card as a cellular level shift. Our passion and energy is alive and active and we are no longer interested in perpetuating an old paradigm. The next two cards I will take as one meaning. Since the temperament of the King is dominating both our present and future card positions, I see this as a fused statement about how we are grounding all the energy unleashed in the 7 of Wands. The Kings are about responsibility and governance; the ability-to-respond. The King of Cups represents emotional maturity through conscious and mindful detachment. 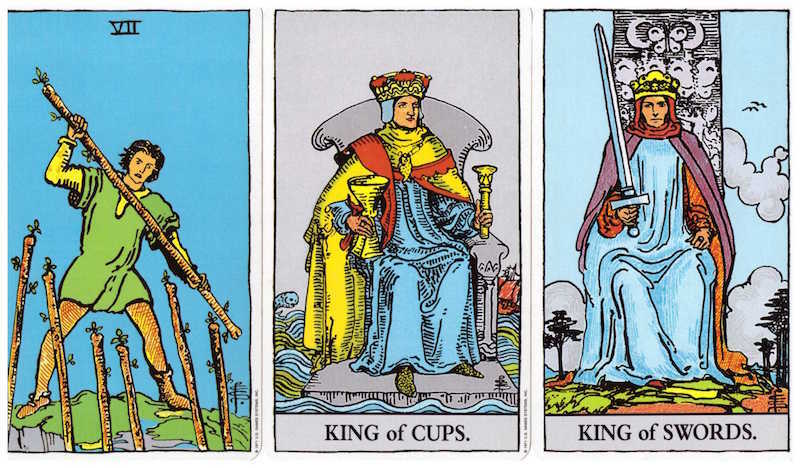 The King of Swords is wise and forward thinking. He is the personification of honesty and integrity and how we express our intellect in the world. When we combine these two beautiful leaders, we are witnessing emotional intelligence – ours. We have become the new example. We have harnessed our potential in our own unique way and are expressing that freely in the world. We have listened to our body’s yearning to be free of the past and have confronted our fears like warriors. In the still moment of that awareness, our past falls away and we are embraced by a vision of ourselves that we have set into motion, which has become our reality. We take up the helm inwardly and outwardly, we are calm and mindful, and our ability to respond is in harmony with our deepest integrity. As the Sun emerges from the dark face of the eclipse, we emerge as well. In our radiance, we shine our light on the Earth and have come to understand, the eclipse process is our process. If you are interested in having a personal reading, please click here for more info. Unfolding Tarot is also now on Facebook! Please feel free to drop by and follow my page. I post my own thoughts and affirmations, and links that may be of value to you. I hope you enjoy them as much as I enjoy sharing them! You’re very welcome as always Grace! I’m really happy you found it useful.